No-one outside the Council’s charmed circle seems to have heard of ward plans. But the ward plans are one excellent way that individual councillors could re-engage with citizens who want to make their area greener and more prepared for the sometimes unexpected changes to come. 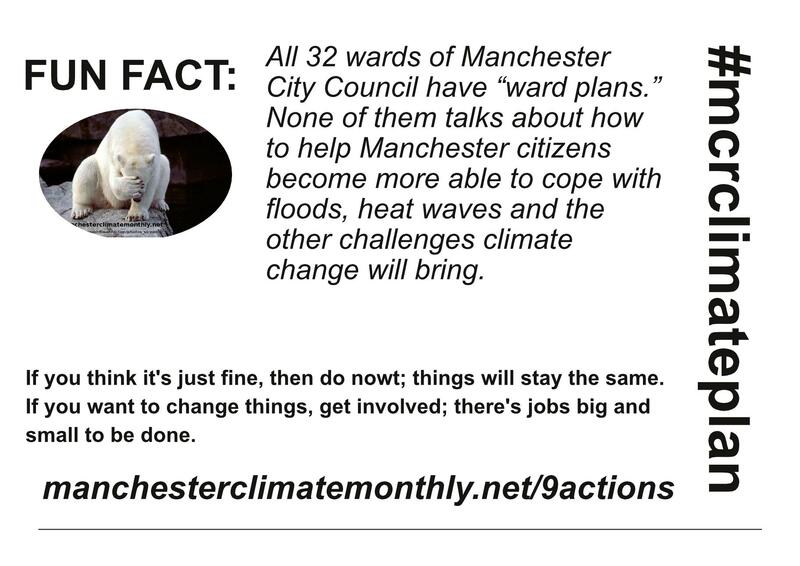 Ensure that the ward plans of all 32 wards (and Strategic Regeneration Frameworks) include concrete actions and SMART goals around both the reduction of carbon dioxide emissions and the risks that Manchester’s citizens will face due to floods, heat-waves and the like. Invite all people who have signed the Open Letter to the Council to get cracking. Get a letter/article in the Manchester Evening News specifically inviting people to get in touch if they’re interested in climate/resourcefulness action in their own wards. Use existing networks (religious, TARAs etc). Have elected members make a public commitment that once they have completed their carbon literacy training they will make regular efforts to publicise the ward plans and start to engage residents in dialogue about how to include both carbon reduction actions and resourcefulness increasing actions. Have an email signature for all ward co-ordinators and councillors that includes links to the relevant pages on which details of the ward pans can be found. Have all the ward plans on the Council’s website with comment forms underneath, so comments can be made, collated etc. Wikis are probably an innovation too far just yet. Keep a league table of which wards have all three of their councillors carbon literated. Celebrate the creation of ward plans with SMART goals around carbon reduction and resourcefulness-increasing. This will be difficult, granted. The centre must view itself as a clearing-house and midwife, not as a controlling intelligence. This may be a bit of a culture shock. But not as much as climate change will be. Yeah, you see, the whole “command and control” mentality might not be the one we want. That said, the risk is that those areas with high-cultural capital will crack on, and those with more immediate concerns (bailiffs etc) are left to rot/devil take the hindmost. YOU HAVE ALMOST FOURTEEN AND A HALF MILLION QUID. Enormous. And think of the confidence that residents will gain by re-engaging with the democratic process, and taking collective responsibility for their own futures. Does this not completely gel with the Council’s stated agendas? More. Of. The. Same. Brittleness, fragility and vulnerability when the expected unexpecteds show up, probably sooner than you think. Get that page up, send out those invites. Bring a report to the Environmental Scrutiny Committee in July about how things are going, asking for help and ideas.